Many SnoreLab users snore with an open mouth and have seen impressive results when preventing mouth breathing whilst asleep. Effective. 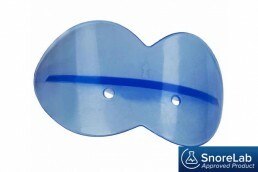 The tried and tested mouth guard technique has shown to reduce snoring for many SnoreLab users. Customisable. Soften the device in warm water and easily fit to the shape of your teeth and jaw for a personalised fit. Slim design. With a focus on simplicity, this device is easy to use and is made from thin, medical grade material, making it comfortable to wear with no feelings of pressure. Safe. Somnipax Shield poses no choking hazard, is easy to remove if necessary and is made from safe, medical-grade synthetics. SomniShop supplies high-quality snoring remedies with excellent advice and customer support. SnoreLab has partnered with SomniShop to get you a 5% discount on their entire range of anti-snoring products. Remember to use the code SNORELAB at the checkout to get 5% off your basket.